Thunderbolt Aerosystems Inc. today announced the release of its THUNDERPACK, a personal propulsion system capable of sustaining flight for longer than ever before achieved and concurrently unveiled plans to develop a jet-powered THUNDERJET with exponentially greater capability. Bench tests of the company’s THUNDERPACK have provided up to 75 seconds of flight time, a 300% increase over what other systems offer, and initial conceptual plans for the THUNDERJET system promise ten-fold increases over state of the art rocket belt capabilities. MOUNTAIN VIEW, CALIFORNIA - 24 January 2008 Thunderbolt Aerosystems Inc. today announced the release of its THUNDERPACK, a personal propulsion system capable of sustaining flight for longer than ever before achieved and concurrently unveiled plans to develop a jet-powered THUNDERJET with exponentially greater capability. Born of Thunderbolt Aerospace founder Carmelo “Nino” Amarena’s desire to shorten the grueling commute to his Bay Area office, THUNDERPACK -- www.thunderman.net – represents more than a decade’s worth of effort to apply modern rocket fuels and propulsion technologies to create a practical and economical personal air vehicle– a 21st Century update of the iconic hydrogen peroxide-powered prototypes of the early 1960s. 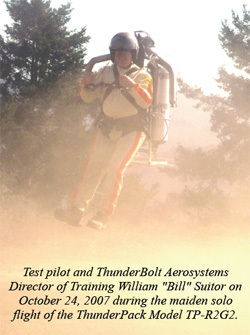 Amarena began his design work by consulting with the engineers and test pilots who had developed and flown the first rocket belts, including the system’s original test pilot, Thunderbolt Aerosystems’ current Director of Training William “Bill” Suitor. Amarena learned that while more than three decades had elapsed since Bell Aerosystems had developed the first systems for the Army, there had been virtually no improvement in the 22 seconds of time aloft provided by rocket belts. Amarena reviewed company and government technical data and designs in the public domain, to quickly develop and peer-review a promising new rocket belt design. The architecture is based on an innovative dual-fuel system, a new catalyst design, specially-formulated fuel “promoters,” and the use of novel, lightweight materials. Bench tests of the new THUNDERPACK design have provided 75 seconds of flight time, a 300% increase over what other systems offer. With a recent test flight of 37 seconds, and a potential dual-fuel feature capable of flying well more than one minute, Thunderbolt Aerosystems is closer than ever to fielding a rocket belt “for the masses.” According to Amarena, such a vehicle could be used for a host of defense, commercial and personal purposes, including support of military missions, disaster relief efforts, border patrol assignments, and even overcoming those snail-paced commutes. The THUNDERPACK can be ordered now and delivered at a price under $100,000. Amarena notes that meaningful increases in system endurance lie in getting beyond rocket propulsion to more efficient, more economical, and more robust jet propulsion. 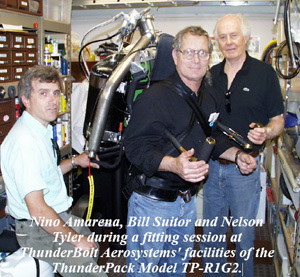 Accordingly, a jet-propelled personal flight system – the THUNDERJET -- is precisely where Amarena’s current research and development efforts are now focused. Indeed, in Phase I efforts, Amarena has identified engines and manufacturing designs for a dual-engine THUNDERJET and foresees developing a system within a year capable of providing up to 35 minutes of sustained flight. Amarena foresees an eventual market price in the $100,000 unit range.